Small, quaint and densely settled, Malé (pronounced Mar-lay) is not a spectacular capital city, but there are several points of interest, and it’s spotless and tidy, with a certain charm all of its own. While it sometimes gives the impression of a sleepy country town, there is new building work everywhere, and the place feels like it will soon burst at the seams. 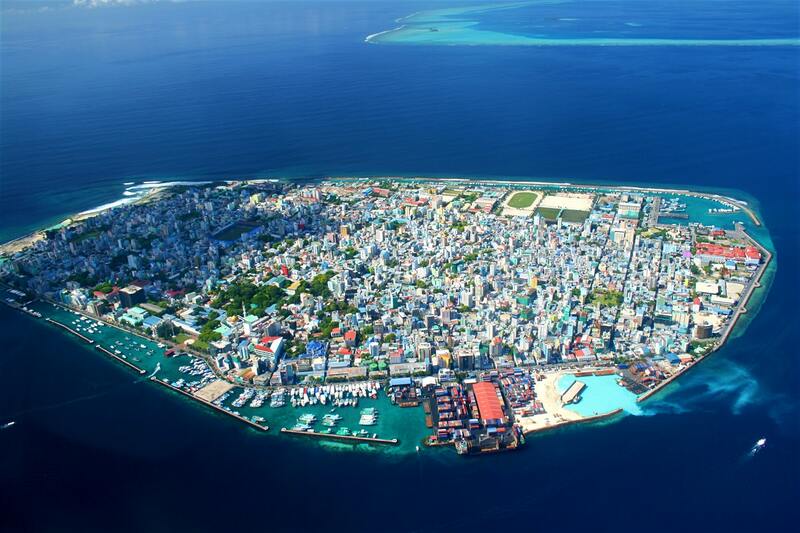 The island of Malé is about two kilometers long and one kilometer wide and packed to the edges with buildings, roads, and a few well-used open spaces. The size of the island has increased considerably through land reclamation projects, and when looking at a map, one can see the irregular street pattern which indicates the extent of the island early this century, when the population was around 5,000. The streets around the edges of the island, laid out in rectangular blocks, are all on reclaimed land which amounts to more than half the total area. The population density and the rate of growth are causing problems. Quaint old buildings are being demolished to make way for bigger, more modern ones, and the quality of groundwater has declined severely. There are still some lovely streetscapes, overhung with shady trees, but the loveliness is imperiled by new construction, and the increasingly brackish water supply may not support trees much longer. The first five-story building went up in 1987, and the maximum permitted height has since increased from five stories to eight, to 12 and is now 15. Tall buildings are erected on tiny blocks of land, and the land tenure system is not conducive to effective urban planning. An interesting architectural feature is the rounded corners of the walls and buildings, especially at street junctions. This makes it easier for vehicles to negotiate tight corners, but it also softens the appearance of many buildings which would otherwise be undistinguished boxes. Many new, multi-story buildings also have rounded edges and are reminiscent of the Bauhaus style, but might also be called Malé Modern. Traffic has increased to unpleasant levels, and it’s estimated that there is now one car for every 16 meters of road in the capital. It’s obviously absurd, as vehicles are mostly unnecessary in such a small area and more vehicles will reduce, not improve the general level of mobility. Nevertheless, cars and motorbikes are status symbols, and despite high import taxes, more and more people seem able to afford them. 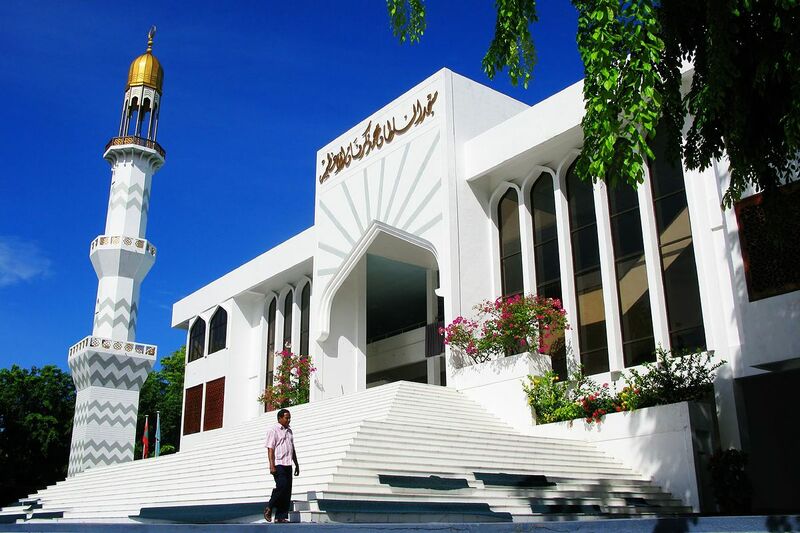 Opened in 1984, and built with help from the Gulf States, Pakistan, Brunei and Malaysia, this miskiiy (mosque) dominates the skyline in the middle of Malé. As your boat approaches the capital, you’ll see the gold dome glinting in the sun. (The gold is actually anodized aluminum). The munnaaru, or minaret, is supposed to be the tallest structure in Malé, but some of the newer buildings may be higher. Visits to the Grand Friday Mosque must be arranged to fit in around prayer times and between 9:00 am and 5:00 pm. (The mosque closes to non-Muslims 15 minutes before prayers and for the following hour). Before noon and between 2:00 and 3:00 pm are the best times to visit. Invading bands of casual sightseers are not encouraged, but if you are genuinely interested and suitably dressed, you’ll get in. Men must wear long pants and women a long skirt or dress. The main prayer hall inside the mosque can accommodate up to 5,000 worshippers and has beautifully carved wooden side panels and doors, a specially woven carpet, and impressive chandeliers. The Islamic Center also includes a conference hall, library, and classrooms. Close by on Medhuziyaarai Magu, Hukuru Miskiiy is the oldest mosque in the country, dating from 1656. (The name means Friday mosque, but don’t confuse it with the much more prominent and newer Grand Friday Mosque. The exterior is protected by a corrugated iron covering, so it doesn’t look like much from the outside. The interior, however, is superb and famed for its intricate carvings. One long panel, carved in the 13th century, commemorates the introduction of Islam to the Maldives. Visitors wishing to see inside are supposed to get permission from an official of the Ministry of Justice & Islamic Affairs, but in fact this might not be too difficult as most of the caretaking staff are officials of the Ministry and, if you’re respectful and well-dressed, they may well give you permission on the spot. Like many old mosques, it was built on the foundations of an ancient temple which faced west to the setting sun, not north-west towards Mecca. Consequently, the worshippers have to face the corner of the mosque when they pray. Overlooking the mosque is the solid, round blue, white tower of the munnaaru – at first, you may think it’s a water tank, but the doors in the side are a giveaway. It dates from 1675 but doesn’t look that old. West of the mosque is a graveyard, with many elaborately carved tombstones. Those with rounded tops are for women, those with pointy tops are for men, and those with gold-plated lettering are the graves of former sultans. The small buildings are family mausoleums, and their stone walls are intricately carved. Across the road from the Hukuru Miskiiyis a blue and white building with an elaborate gatehouse. This is the Muleeaage Palace, built as a sultan’s palace was deposed before he moved in and the building was used for government offices. 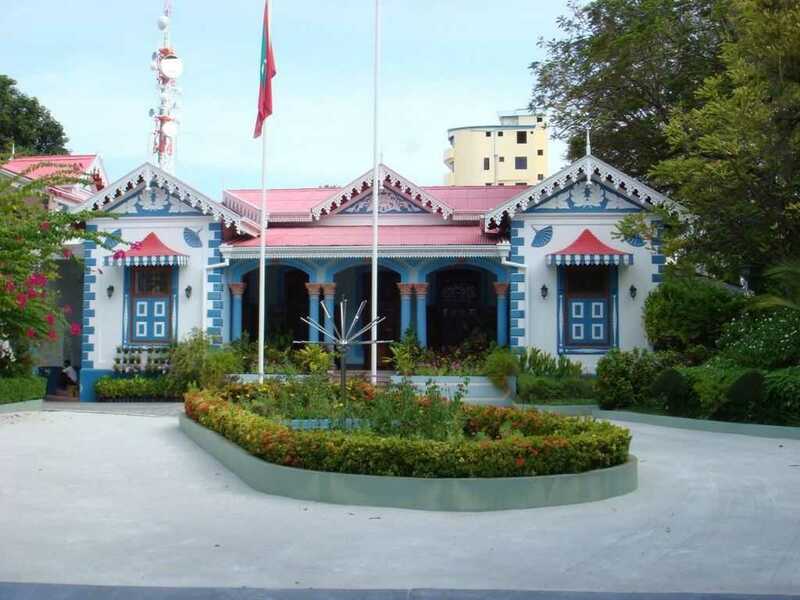 It became the president’s residence in 1953 when the first republic was proclaimed, but President Gayoom moved to a new official residence in 1994. 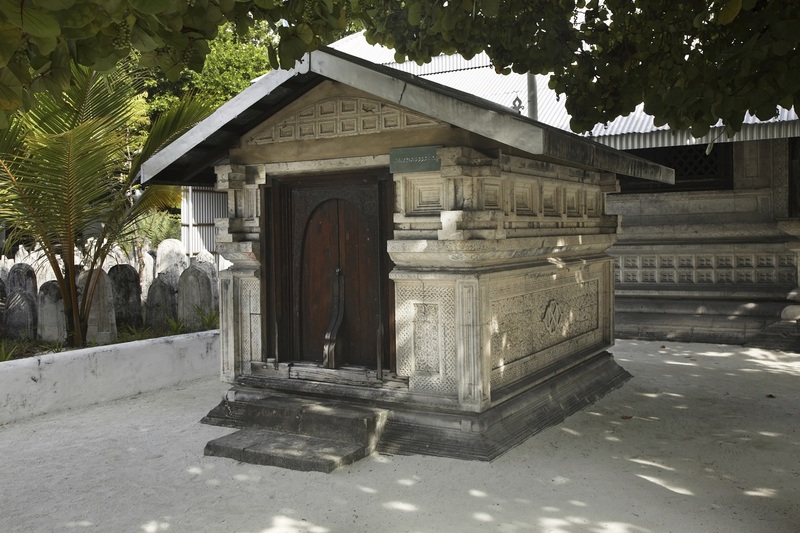 At the eastern end of the building’s compound, behind the gatehouse, is the tomb of Abu Al Barakaath, who brought Islam to Malé in 1153 AD. The small, three-story building which houses the museum is the only remaining part of the original sultan’s palace – the rest was demolished in 1968 at the beginning of the second republic. The museum has an ill-assorted collection that is not very well displayed, but it’s worth a visit. Many of the exhibits are things once owned by the sultans – clothing, utensils, weapons and a throne. Some of the fabrics are beautiful, especially the rich brocades. Excellent, traditional lacquer work is displayed on the large bowls and trays which were used to bring gifts to the sultan. Weapons include bonthi sticks, which were used in martial arts, and a silvan bonthi, used by a husband to punish an unfaithful wife. Especially interesting are the pre-Islamic stone carvings collected by Thor Heyerdahl and others from sites all over the country. They include a beautiful Buddha’s head and various phallic images. Unfortunately, they are poorly labeled, and there’s nothing to explain the significance or historical context of these fascinating finds. Miscellaneous items include a WWI German torpedo (donated by a Royal Navy warship), a Maldivian flag which was taken into space by US astronauts, and two motorbikes with bullet holes from the 1988 coup attempt. The National Museum is open daily, except government holidays, from 8:00 am to 11:40 am and 3:00 pm to 5:00 pm. The park surrounding the museum was once part of the grounds of the sultan’s palace. It is a small but pleasant retreat from the streets. Officially, it’s only open on Friday from 4:00 pm to 6:30 pm, but the museum is inside the park gates so you can get in any time the museum is open. This shopping area, along and around Chandani Magu, Faamudheyri Magu, Fareedhee Magu, and Orchid Magu, has lots of souvenir shops, a few cafes and a couple of hardware shops. 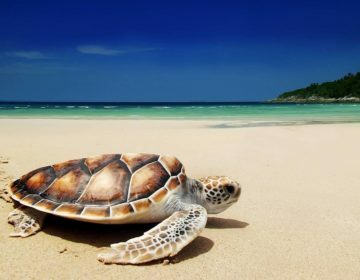 It’s convenient if you want to go to a lot of shops in search of something special among the masses of T-shirts and the Balinese wood carvings. 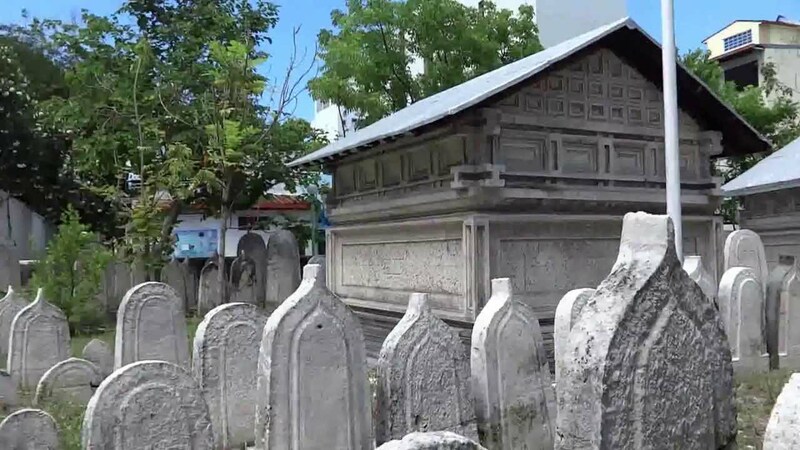 In the back streets in the middle of the town, in the grounds of a small mosque, is the tomb of the Maldives’ greatest hero, the man who liberated the country from Portuguese rule and then became sultan from 1573 to 1585. 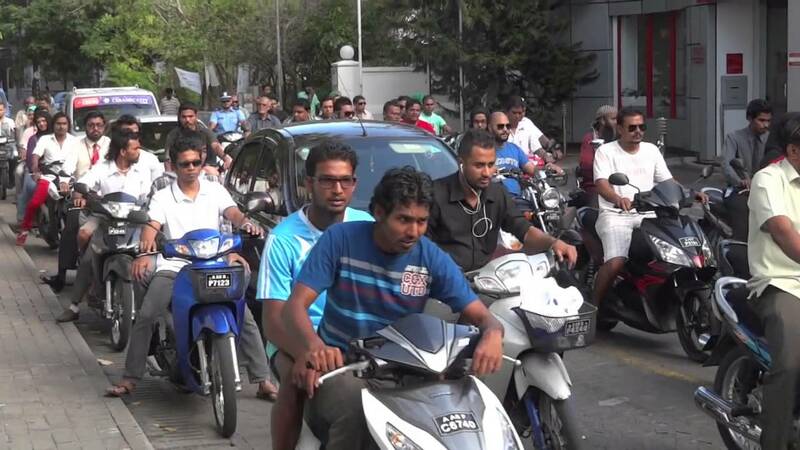 He is also commemorated in the new name for Marine Drive – Boduthakurufaanu Magu (‘bodu’ means big or great). 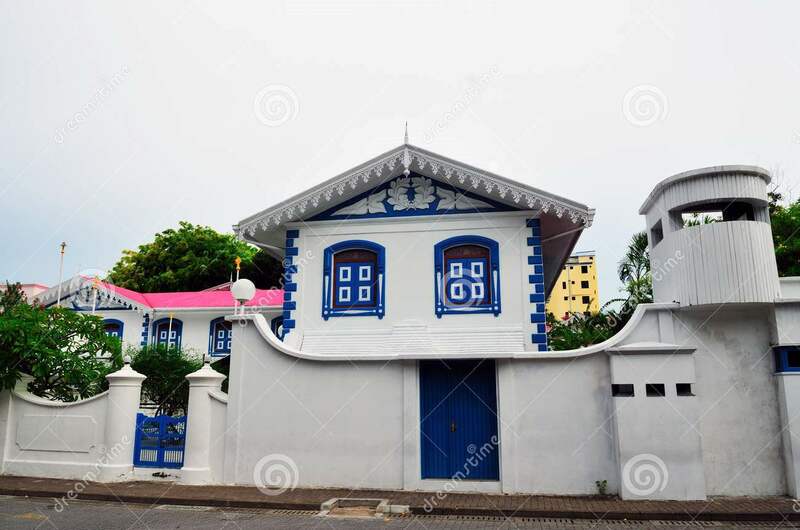 There are more than 20 miskiiys in Malé; some are more simple coral buildings with an iron roof and others are quite stylish with elegant minarets. An interesting diversion (or excuse for a walk around Malé’s coastline) is to see how many ancient cannons you can spot. Most are from the 10 old bastions which were built around the island in 1632 to deter any Portuguese attacks. The strongholds were demolished in the 1960s, and the cannons became landfill, but dredging work uncovered some of them, which were cleaned up, decorated and proudly placed along the waterfront. There are two sorts of places to eat in Malé; Maldivian tea shops and cafés, and modern, European and Asian-style restaurants. Tea shops are frequented by Maldivian men – it’s not the done thing for a Maldivian woman to be in one, but there is no law against it. Foreign women use them sometimes, generally with a male companion, and there is no problem. They’re a great place to meet the local gentry and are very cheap. 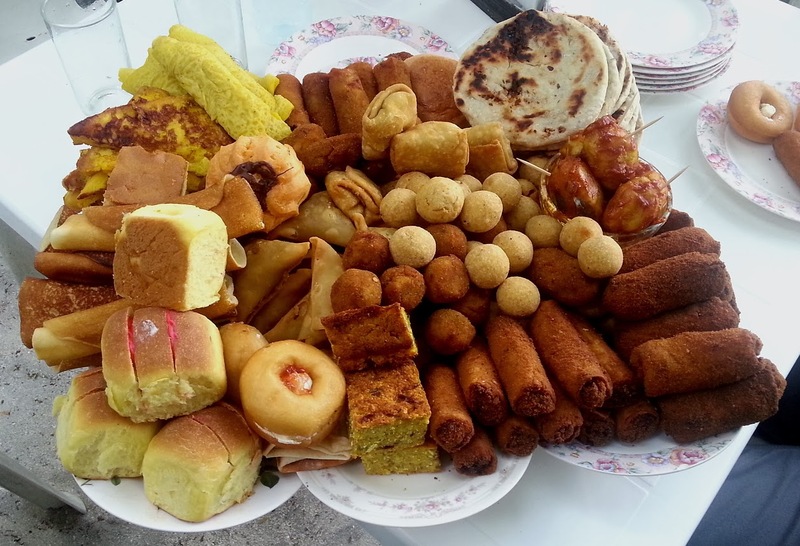 Tea shops will always have ‘short eats’ – a selection of small items called hedikhaa, which include little bowls of rice pudding, tiny bananas, wobbly gelatinous pieces of indeterminate color and taste, curried fish cakes and frittered dough balls, which are sometimes empty, sometimes filled, usually fishy and mostly spicy. There is a selection on the table, you help yourself like a buffet-style restaurant, and the waiter totals it up by counting the number of empty and partly empty plates and writes the amount on a scrap of paper. Pay the waiter or the person at the door. Especially at meal times, they also serve ‘long eats,’ such as omelets, soups, curried fish, Roshi (unleavened bread) and sauce. Maldivians tear up the Roshi, mix it in a bowl with soup or curry, and have it for breakfast or lunch. A cup of sai (tea) accompanies the food and is usually drunk black and sweet. A bigger and slightly better tea shop might be called a café or ‘hotel.’ Often you can phone the local tea shop, and they’ll deliver short eats. Tea shops open as early as 5:00 am and close as late as 1:00 am, particularly around the port area where they cater to fishermen. They close their doors for 15 minutes at prayer times, but if you are already inside, you won’t have to stop talking or eating, and they certainly won’t throw you out. During Ramadan, they may not open at all during the day. There are dozens and dozens of tea shops in Malé, mostly low-key and inconspicuous establishments without a big sign out on the front. You’ll find them on almost every street. They’re similar in décor, menu, service, and price. There are quite a few tea shops along the waterfront. Near the east end of Marine Drive, the very popular Queen of the Night has tables next to the street where men can play carom and chess until all hours. The tables in the back and upstairs are always busy with guys grabbing some short eats. Further west is the Beach Restaurant, a more elegant version of the tea shop. It serves tasty versions of the usual short and long eats, but it’s air-conditioned, and for young local guys it has the great attraction of young women waiting on tables. Everyone is very well behaved, but this passes for wild nightlife in Malé. In the area around the fish market, there are quite a few standard tea rooms. One of the bigger ones is the Dawn Café, where you can get a brilliant meal – try it on Friday afternoon when people come in after going to the mosque. At the west end of Majeedi Magu, there is a well-patronized place under the Star Cinema, which does delicious fresh fruit juices. Across the road is the Fini tea shop, a cool place for a breakfast of Roshi and mas huni (flatbread and shredded tuna with spices). In the Singapore Bazaar area, Jaafaiy has excellent short and long eats, though it can sell out of the tastiest items. There are quite a few tea shops around the stadium. Near the entrance is Orange, with excellent, take-away hedikhaa. Camy Cool Spot, on Majeedi Magu, has some of the spiciest snacks. South Restaurant, behind the National Stadium, has a consistently good selection of short eats. 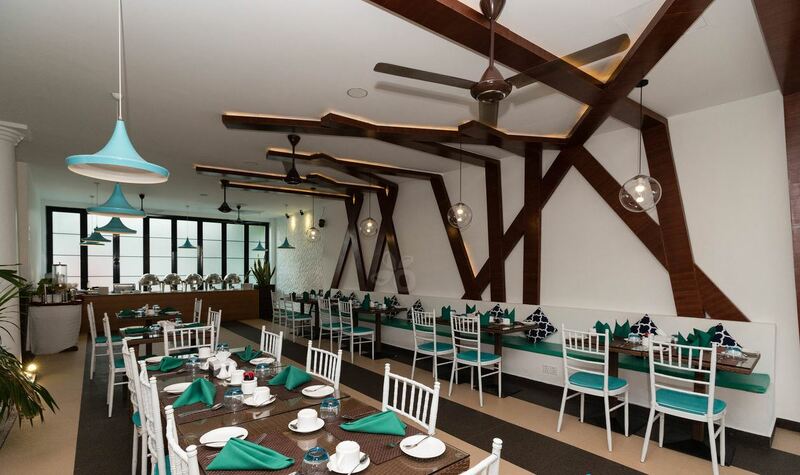 Most of the Malé restaurants are distinguished by their fancier appearance, higher prices, and the fact that there are women inside, and they serve a range of international dishes which are usually palatable, but rarely outstanding. 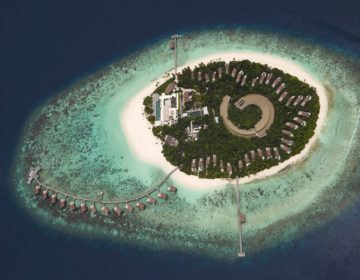 The customers are day-trippers from nearby resorts, business people, sundry expats, and young Maldivian couples. None of these restaurants serve alcohol, but some serve an Amstel non-alcoholic beer. One of the most pleasant and popular places is the Seagull Café and the corner of Chandani Magu and Fareedhee Magu. It serves sandwiches, snacks, and delicious juices, and it’s slightly pricey, but worth it for the pleasantly shaded outdoor eating area. Nearby on Faamudheryi Magu, Slice Café is good for breakfast and snacks, including burgers, juice, and cappuccino. A couple of doors, down an uninviting alley, is the Nanhai Chinese Restaurant where westernized Cantonese main courses are served, but nothing special. The well-established Twin Peaks is a basic Italian restaurant on Orchid Magu. It serves good pizza, pasta, fresh fish and seafood dishes, and desserts such as ice-cream and real coffee. The atmosphere is pleasant, and the service is good. It’s quite a smart place really and popular with business people and expats. Some of the best food in town is served at Thai Wok on Marine Drive. The Thai curries and the rice dishes are very good and not too expensive. At Quench, in the middle of Majeedi Magu, you can eat indoors in chilly air-con or outdoors under a thatched roof. The menu includes hamburgers, egg and chips, spaghetti, sandwiches, and Chinese dishes. There are three Indian restaurants. The Park View on Chandani Magu, has thick tablecloths, tasteful furniture and the highest prices in town. At the other extreme is the Indian Restaurant, on Majeedi Magu, with appearance and prices on a par with tea shops, but it serves good curries and is popular with foreign aid workers. Evening Café, on Orchid Magu, is slightly more expensive. 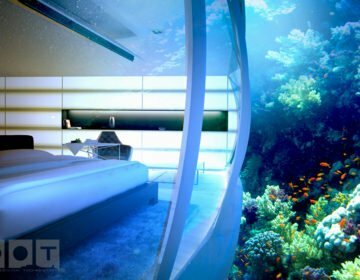 Other restaurants which are worth a try include the Intimate, the Symphony and the restaurants on the top floors of the Relax Inn and the Kam Hotel. At the Nasandhura Palace Hotel, Trends is a pleasant outdoor restaurant which offers a varied menu including Trendy Special Rice which is pretty tasty. At the airport, there’s an open-sided snack place with lots of white plastic tables where you can get a cheap salad roll and a Coca-Cola. Outside the terminal building, facing the dhoni dock is the Satellite Restaurant which serves sandwiches, spaghetti, and burger and fries. There may be no nightclubs, dance halls or discos in town, but Malé is a surprisingly lively place from about 8:00 pm to late in the evening. Majeedi Magu bustles with late-night shoppers and cafés full of people. Visitors and expats dine out or go to the cinema. The Olympus, on Majeedi Magu, across from the stadium, specializes in three-hour Hindi epics, while the Star, at the west end of Majeedi Magu, is more likely to show an American action movie. 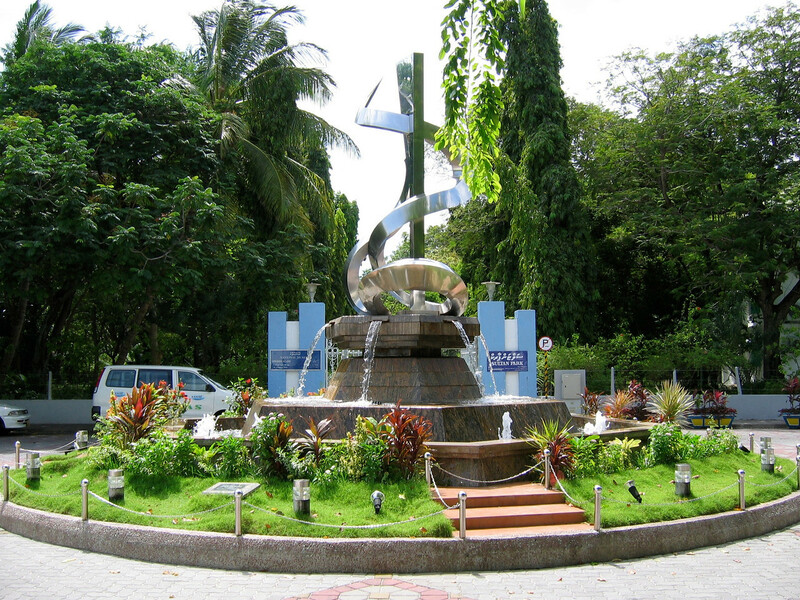 Cultural exhibitions are sometimes put on at the Olympus cinema or at the Maldives Center for Social Education at the west end of town. Except during holidays and festivals, the only daytime diversions are football and cricket matches at the National Stadium. 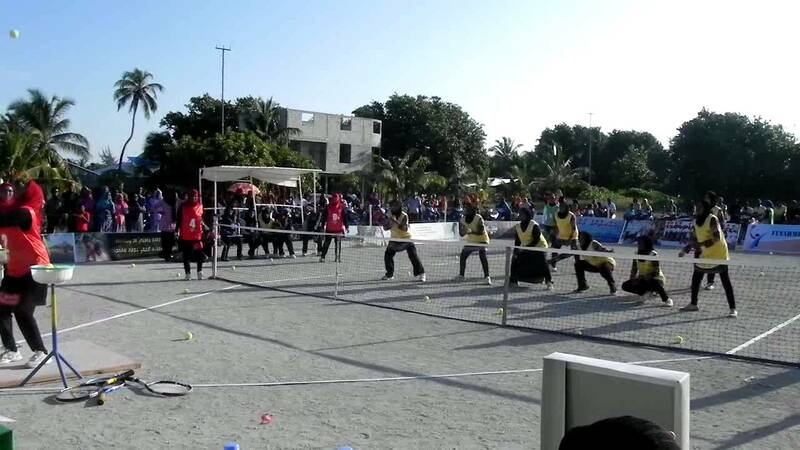 More casual games of football, volleyball, basketball, and bashi can be seen any evening in the parks at the east end of the island. The game of bashi is a popular pastime. On Thursday night and Friday, many expats head out to one of the nearby resorts for a drink and some socializing. Bandos Island often provides a free boat, while Baros Island waives the charge for day use of its public facilities by volunteer aid workers. 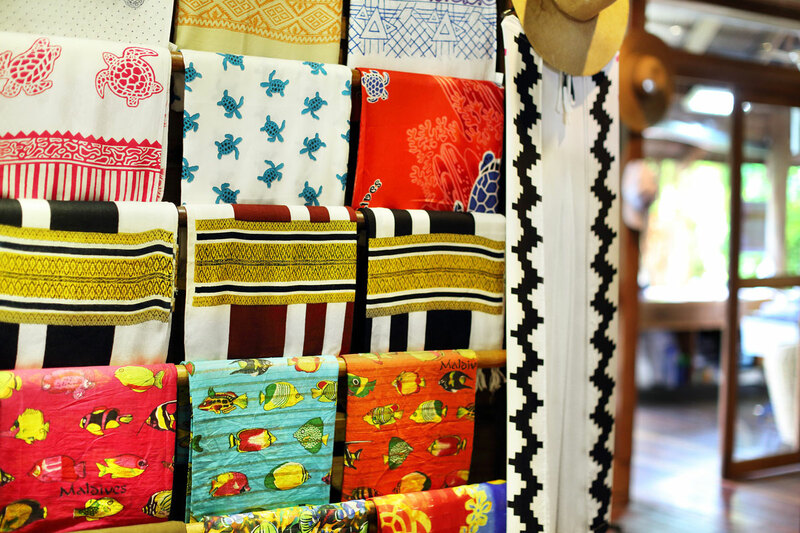 Most of the shops selling imported and locally made souvenirs are in the streets of the Singapore Bazaar area. Many of them have a very similar range of stock, but it’s worth browsing in quite a few if you’re looking for a particular item. One place with some interesting antiques and Maldivian craft items is Gloria Maris, on the corner of Fareedhee Magu and Faamudheryi Magu. 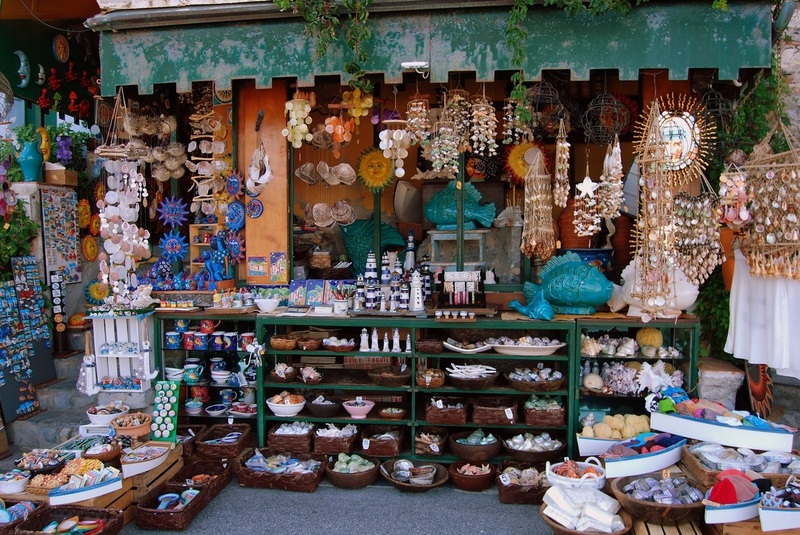 For less traditional souvenirs, look in the local hardware, chandlery and general stores along the waterfront west of the fish market and down Fareedhee Magu.